I was altering the config files on the SD cards that came with my NB board, to make the two hilts a little more sensitive to swings. One of the hilts stopped making sounds midway through testing after putting it back together. It worked fine for a bit, then would seemingly try to make a bit of noise, then nothing. I swapped the SD card into the other hilt, works like a charm. So does its original card. Pulled the soundless hilt apart again, and checked the speaker connections to the NB board. Look fine. Popped out the speaker itself, it looks fine. No damage anywhere, no loose wires. Re-assembled it for one last test, now it doesn't even try to make sound. Nada. LED works fine, turns on, flickers, turns off, etc. Should I order a new speaker, or is this problem deeper? Seems odd that it would work super one second, then just...crap out. If they are fully charged, it could be the speaker. I would make sure the batteries are fully charged first. Oh, yeah. Plenty o' juice. No problems there. In a little bit of "everything going right for a change," it was just the speaker. New ones (I got a couple extras) arrived from Tim yesterday, and I soldered one in today. Plenty'o'sound now. Yay! A long time ago, a previous version of those premium speakers use to go bad on a fairly regular basis, and then Tim replaced those with these current ones. Happy to hear that it's working now! I am seeing the same issue on my saber. LED comes on and flickers as it should, but no sound. Does anyone know what the resistance of the Premium 28 mm speaker is? The speakers in the store are 8ohm. Mine just did the same thing. It was on, and the sound was running, then CCCFKKKK ...nothing. I fully charged it, but there is still no sound. I could find no loose connections. Is it possible that these newer speakers also go bad unexpectedly? Last edited by Baryonyx; 01-14-2015 at 03:25 PM. 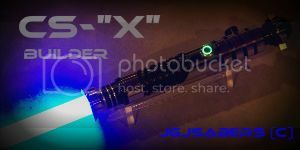 Turn your saber on (light but no sound right? ), now gently place you fingertip on the black speaker surface and press gently. If sound comes back temporarily, you probably have a blown speaker. If sound does not come back while pressure is applied, It could still be the speaker, or something else entirely.